Are they really security cameras, though? If they're not provided by a security dealer and connected to a genuine security system, the answer is: probably not. Here's why. Imagine that there's a burglary at your house while you're out. Your standalone camera will capture the footage and alert you in real time! But what if you're out at dinner, or in the gym? Or taking a nap on vacation? Or on a plane? Even if you spot the alert within a few minutes, it's too late. That's why real security cameras are connected to a security system which connects in turn to a 24/7 monitoring station. In the event of a burglary, trained security professionals assess the situation and can call the police. Meanwhile, the camera will automatically capture and securely store footage of what happened in the cloud. If your camera is badly positioned and easily unplugged, it's not a security camera. Installation makes a huge difference. A security camera installed by a professional can be mounted on a high wall or even out of sight. Positioning a camera in just the right place, to capture a broad range of activity, is critical. Want to connect with an Alarm.com dealer? Click here to get started. A security camera typically minimizes its power supply's vulnerability with tamper-resistant features such as in-wall wiring or battery power. Others include water and ice-resistant protection for use outdoors – after all, that's where burglaries start. Security isn't just about catching something bad – it's about peace of mind. True security cameras, as part of a smart home security system, enhance it. Part of this includes minimizing false video alerts by understanding context. An Alarm.com-powered security camera has access to context from the entire security system. It knows your arming status, door and window status. It knows if your smart lock is open, and who opened it. This makes it far more discerning when it comes to alerting you about activity. 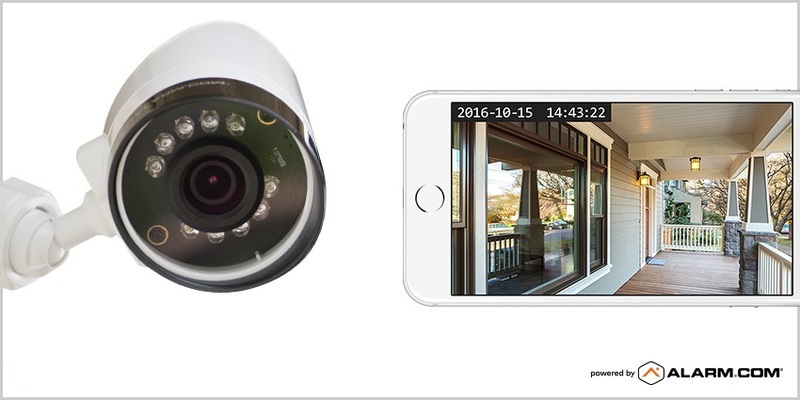 If you really need a video alert every time your front door opens, you can still get one. But if you just want a single daily alert when your kids get home from school, your security system will filter out everything else. It has the intelligence to figure it out. To find out more about smarter home security from Alarm.com, click here.